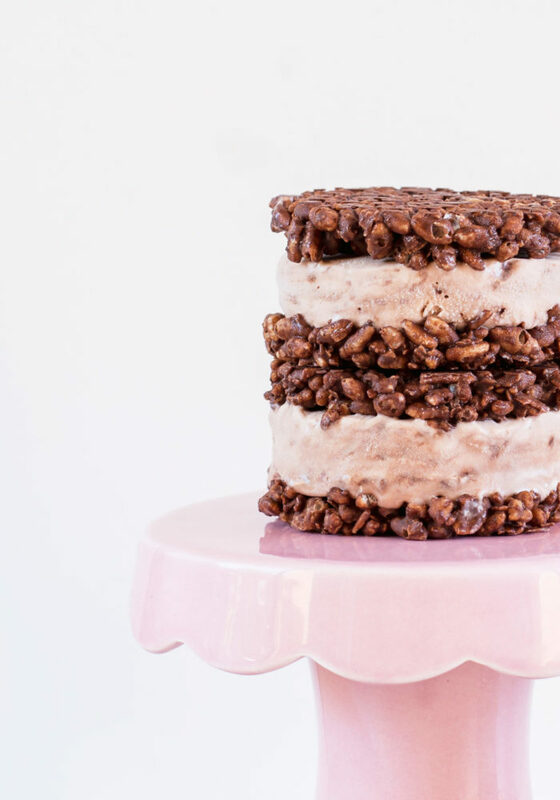 Chocolate Crackles are one of those nostalgic childhood treats that made a regular appearance at Australian birthday parties when I was young. 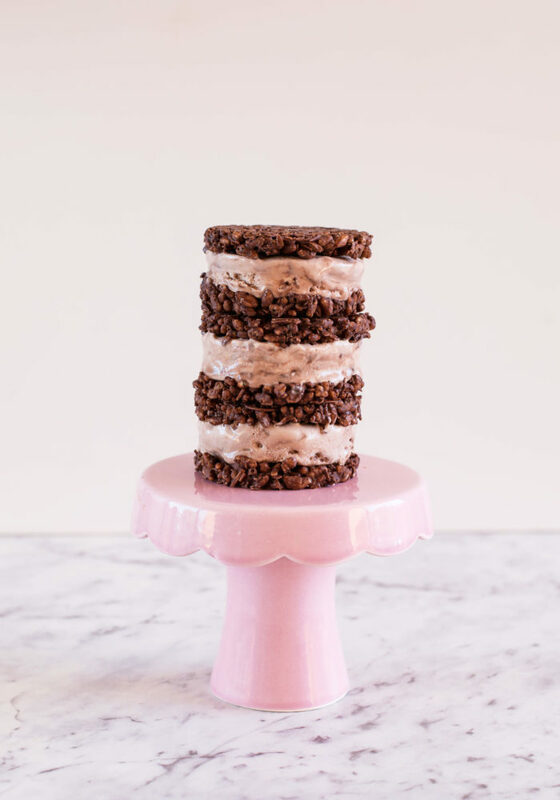 For my overseas readers, a Chocolate Crackle is made of rice bubbles, vegetable shortening, icing sugar, cocoa powder and desiccated coconut and is often served in cupcake papers. 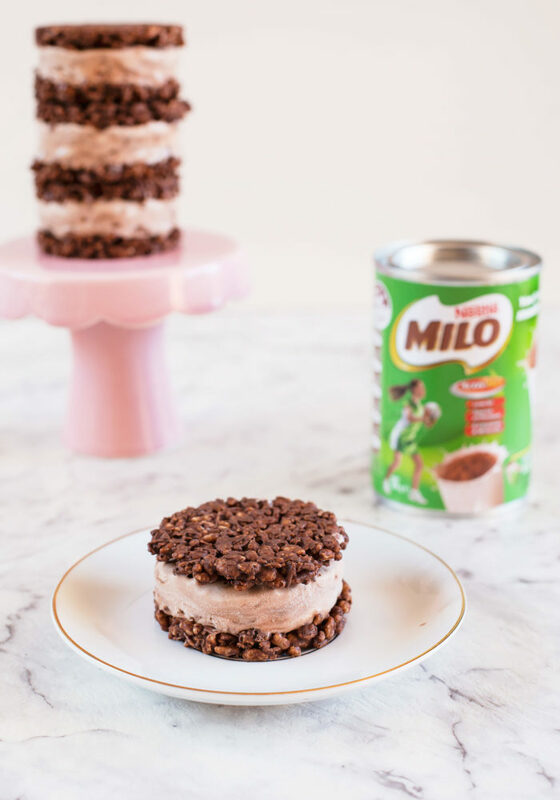 I’ve reimagined them before in the form of a Chocolate Crackle x Honey Joy hybrid dessert and this time I wanted to combine the flavours with another childhood favourite… Milo! (Who am I kidding, I still enjoy Milo as an adult too). 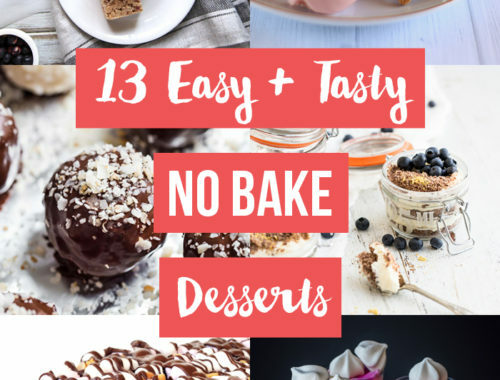 I went through a few dessert ideas, such as a Milo cheesecake or pie with Chocolate Crackle base or a crunchy chocolate milkshake. 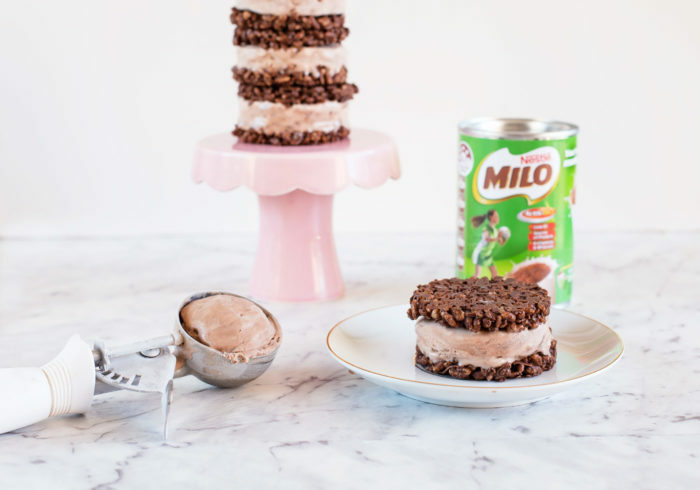 I finally settled on creating a no-churn Milo ice cream, and thought the perfect delivery system would be to create Chocolate Crackle “cookies” and sandwich the ice cream between them. It’s summer in Australia right now, so it sounded quite like heaven! 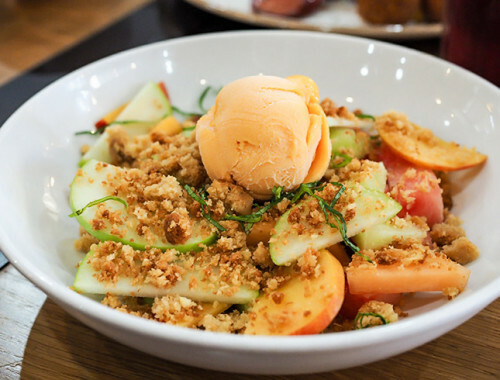 While this recipe is incredibly easy to make and only takes a few ingredients, you will need to start the night before to ensure the ice cream has sufficient time to chill. 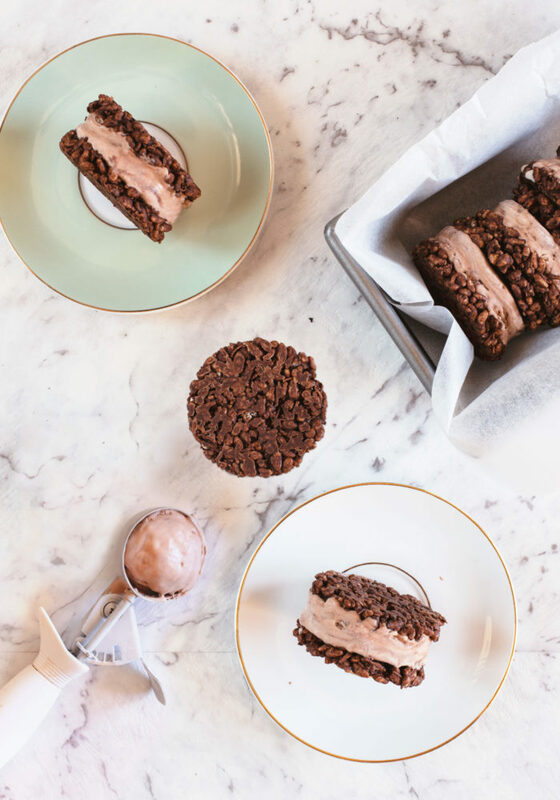 This ice cream forgoes cooking egg yolks, or requiring an ice cream maker, and is simple as stirring a few things together! 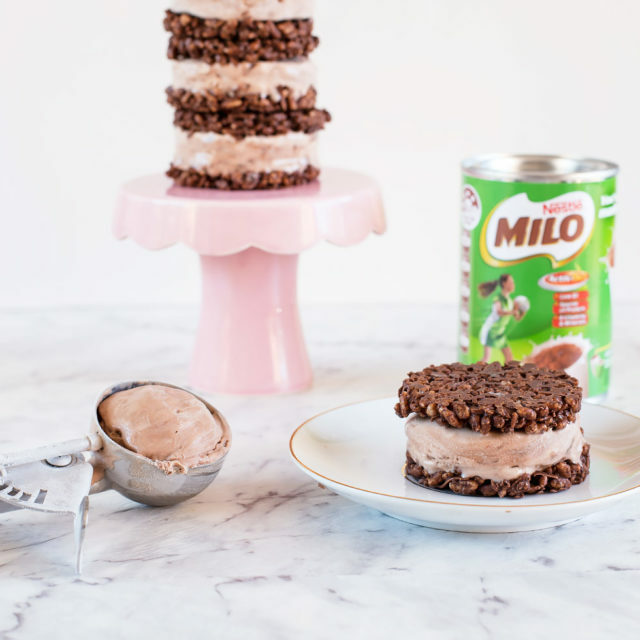 The lightly whipped cream gives the ice cream its richness and fluffiness, the sweetened condensed milk adds sweetness, and the Milo brings in loads of flavour as well as colour. I poured the ice cream into a lined baking tray to chill, so that it’s easier to cut out ice cream circles later. As for the Chocolate Crackle cookies, I tweaked the original crackle recipe to suit my tastebuds as I found the OG a little sweet. Instead of icing sugar and cocoa powder I used dark chocolate, and instead of the vegetable shortening I used coconut oil. Then it was basically a process of melting and mixing the ingredients together, before forming into flat discs with the help of eggs rings or cookie cutters. Using an electric mixer, beat the thickened cream until soft peaks form. Add the sweetened condensed milk, Milo, vanilla extract and salt to the whipped cream and gently fold together. Take care so you don't deflate the air you just whipped into the cream. 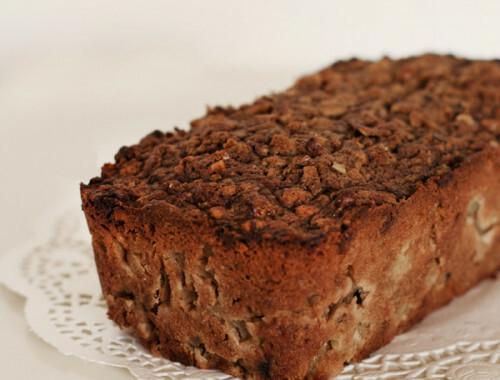 Pour the mixture into a baking tray lined with parchment paper and freeze for at least 6 hours, or ideally overnight. Combine chocolate and coconut oil in a metal bowl over a saucepan of water (make sure the bowl doesn't touch the water) and bring the water to boil. Remove from heat and allow the residual heat to melt the chocolate. Stir to combine the chocolate and coconut oil. In a separate large bowl, combine the Rice Bubbles and coconut. 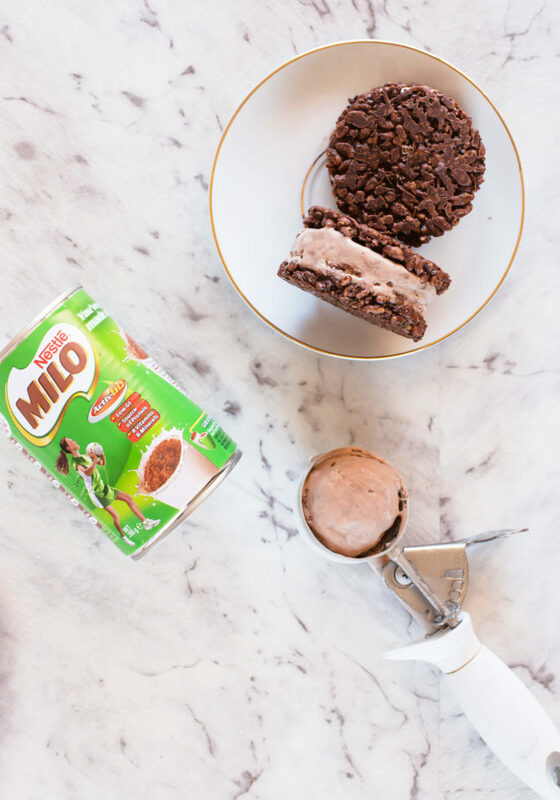 Pour the melted chocolate mixture over the rice bubbles and stir until the dry ingredients are evenly coated in chocolate. Place 10cm round cookie cutters or egg rings onto a baking tray lined with greaseproof paper. 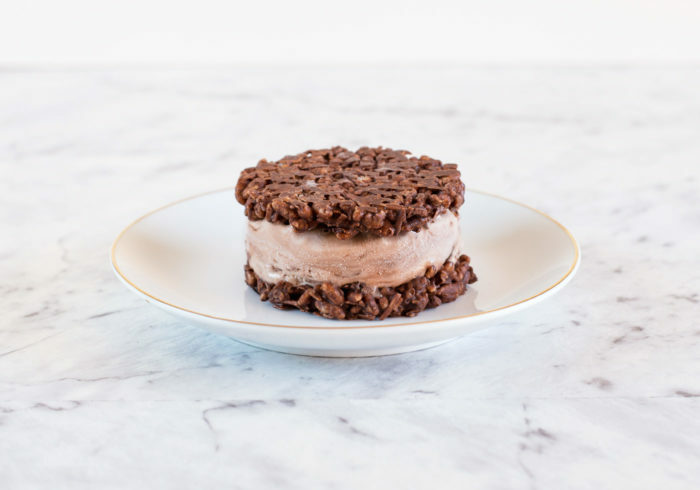 Dollop approximately 2 tablespoons worth of chocolate crackle mixture into the ring and press down using your fingers. I also found gently pressing down with the bottom of a lightly greased jar works well too. The mixture will hold its shape, so remove the egg rings and keep repeating this process until you use up all the crackle mix. Transfer the cookie rounds to the fridge to set. Remove the ice cream from the tray and cut out round of ice cream the same size as your cookies. 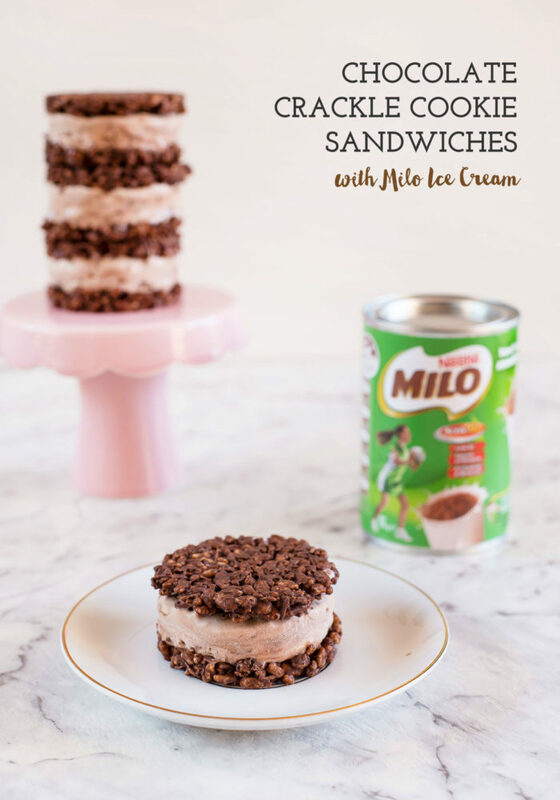 Sandwich the ice cream rounds between the chocolate crackle cookies and enjoy! And the result? I have to be honest with you guys here, and I don’t want to appear conceited, but these are ABSOLUTELY FREAKING INCREDIBLE. 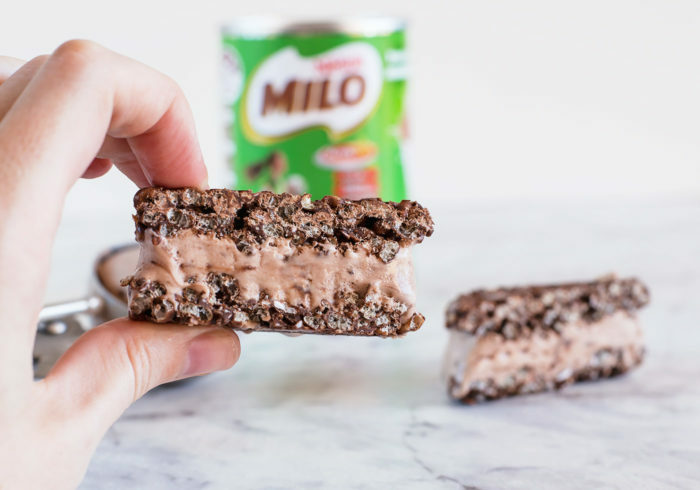 The cookies are crunchy and coconutty and not too sweet, and are the perfect accompaniments to the unbelievably rich and creamy Milo ice cream. Of course, the day I had set aside to photograph these happened to be 38°C (that’s 100F), so please excuse the various stages of melting in the pics! It was a fun task of removing from the freezer, arranging the shot, taking a few photos, taking the sandwiches back to the freezer to re-set for 30 mins, rinse and repeat. 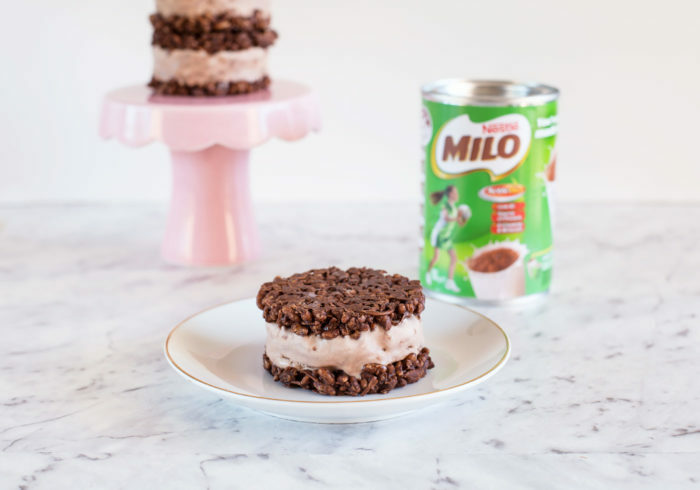 I hope you love this new twist on 2 classic Aussie treats as much as I do, enjoy! This is like the ultimate nostalgia food! 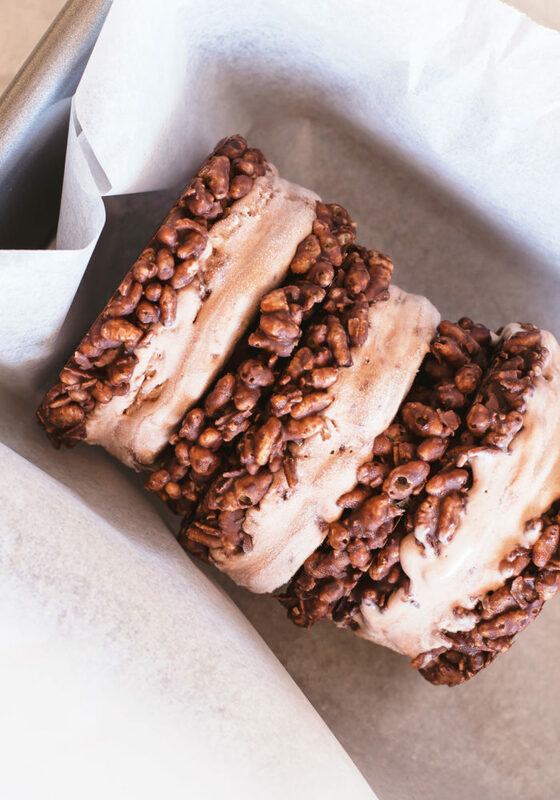 I haven’t eaten a chocolate crackle since I was 7 :D I like the idea of using coconut oil better than copha (i imagine it would be lighter and less cloying on the tastebuds) YUM!